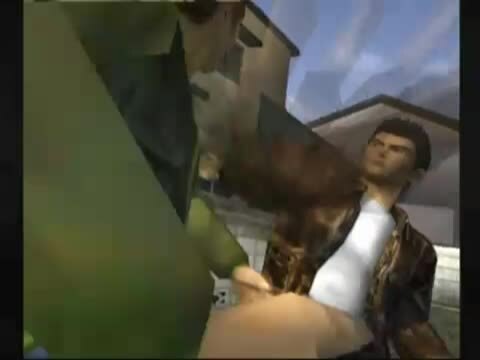 If i had to choose a video game that summed up the Martial Way then the mighty Shenmue would be the one. Created by legendary Game creator Yu Suzuki from Sega's AM2 department it was the first video game that immersed you in to a Real life world where you had to go to sleep at night ,travel to places ,find jobs and generally pass the time .Hence the label by Yu Suzuki as F.R.E.E. 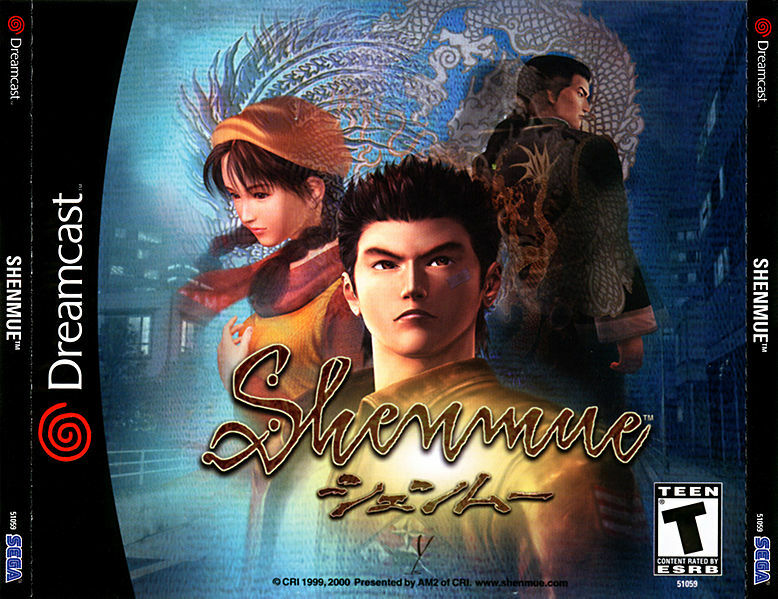 which stood for '' Full Reactive Eyes Entertainment'' Giving Shenmue it's own Genre and one that has never been approached in the same manner again ,though Sega's own Yakuza series on Playstation 2 and 3 are similar in it's style and story driven proceedings. 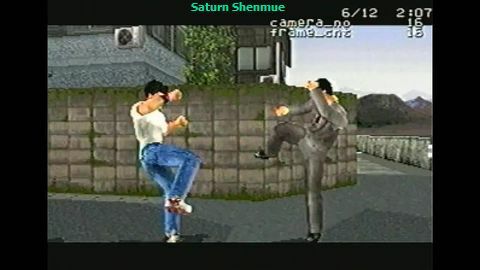 Shenmue was originally benchmarked for the Saturn console ,under the working title of Project Berkeley ,but when the Saturn failed to stand up against the might of Sony's Playstation with it's dedicated 3D chip heavy games it was decided that the Saturn best be put to rest. Yu Suzuki who had been working on the title was not to troubled by this as he new of Sega's work on the new KATANA console ( Renamed Dreamcast for launch) ,he was sure it would be easy to transfer the idea to Katana ( he was probably pleased as even he said Saturn was a bugger to program for) , with the ease of Katana's programming techniques and the fact it used a open world operating system made life easier to. Now for you Dreamcast (Katana) owners two dates are important to you ,the first is ''November 29th 1986'' ,the next date varies to where in the World you are . and if in Europe then the date would be '' November 24th 2000''. 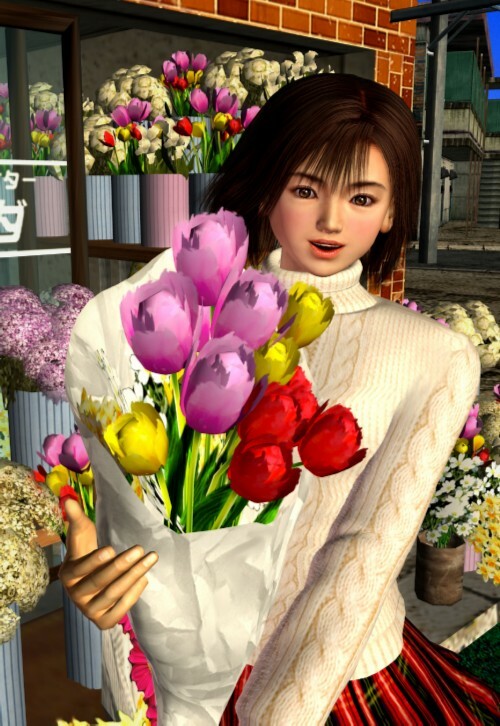 Yes the first date is the date when you start the game Shenmue ,the second date is of course the release date for the game in various regions. If only they waited another 5 days in Europe ,how cool would that be? Now with nearly a year between the Japanese and American and Europe releases Dreamcast owners in the latter regions where on tender hooks for months. Unless of course you could understand Japanese then you could import the game and make your friends jealous. Of course the translation of the game into English took a while ( if they had subtitled like part 2 it may have been sooner) . Everyone new of this game ,but by the time the game arrived in the west it looked liked Sega where spewing money from every orifice . But at that time Dreamcast was starting to gain respect and selling consoles ,partly due to Sony's failure to deliver enough Playstation 2's for the Christmas 2000 rush. I for one remember waiting for the date in Europe and picking up my copy on the day of release . 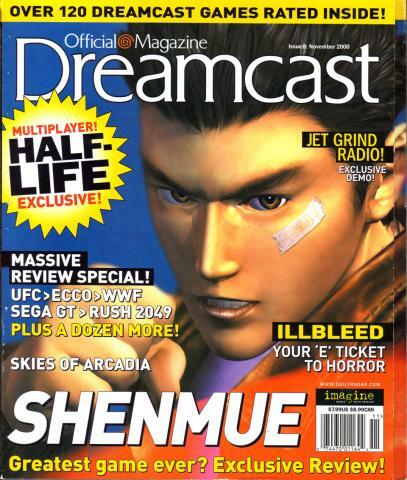 Nothing could prepare me for the experience that the Dreamcast would unleash on me that day in November 2000. But it was not just me that got swept away in a story that would literally take over my life for weeks ( I was thinking of changing my name to RYO by de-pole at one point ) , I had spoken to others and the story was the same, in fact I was part of a band of people who's lives where disturbed by real life events like having to go to work,wash,eat,sleep or anything else you actually you need to do ,why because in my mind I was already doing this in SHENMUE. 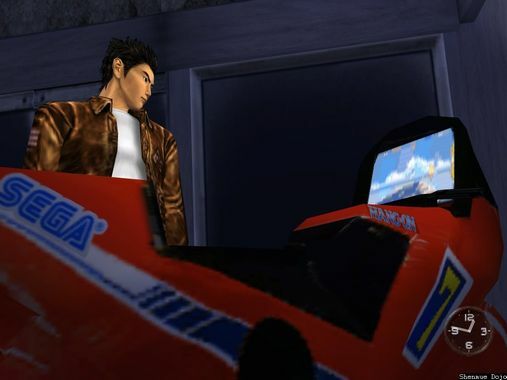 SHENMUE had arrived and the fine line between gaming and real life was never the same again. So what is it about this game? 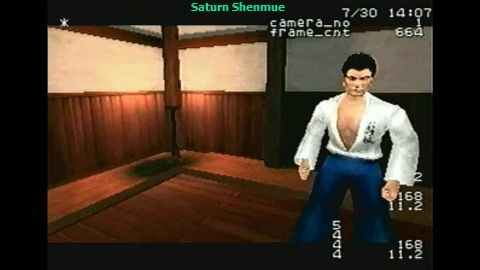 Shenmue was originally conceived on Sega's Saturn console, a total of about two years work was put in to the project ( project Berkeley) Whats amazing from the screen shots and video ( all of which feature on a special disc with the Japanese edition of Virtua Fighter 3tb on Dreamcast) is how great the game looks ,surpassing that of anything the PS1 could do ,it's a shame that SATURN was a problem to program for as if it was easier I'm sure Shenmue would have been released on the machine in a timely manner and maybe securing a brighter future for SEGA as a hardware innovator ,of which they clearly where. Ryo ! Get of that Deer. on Dreamcast 2 if things had gone better. 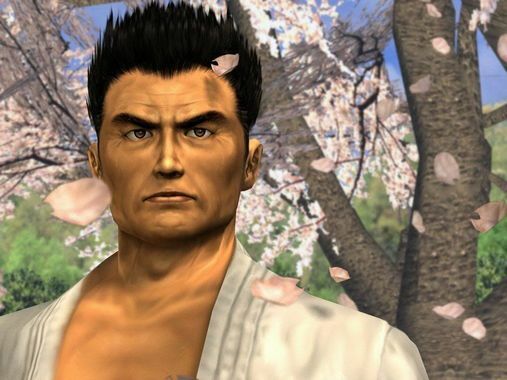 But remember Shenmue was first conceived as a Virtua Fighter RPG ,which took on a life of it's own and eventually appeared on the Nintendo Gamecube. 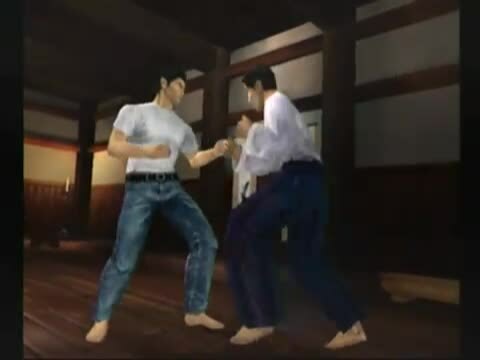 Shenmue takes place in a Harbour town called Yokosuka ,within the town is the Hazuki Dojo where Young Ryo Hazuki lives with his Father .The game starts with a cinematic event in the life of young Ryo Hazuki . 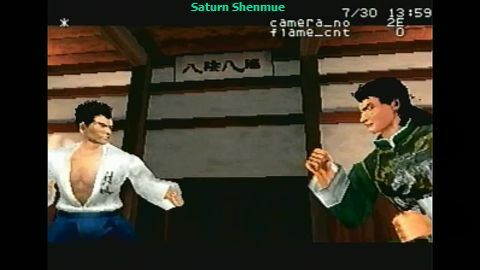 Ryo returns home to find his father Iwao Hazuki in confrontation with a man by the name of Lan Di, The man who is tall and dark wears a Green Kung-Fu suit . He demands from Iwao a item by the name of the Dragon Mirror. 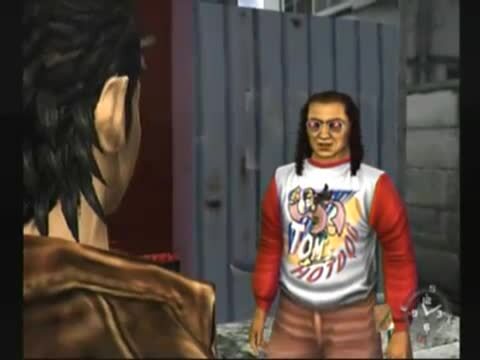 Iwao refuses but when Ryo acts on impulse and attacks Lan Di he gets put down by this ominous man. With Ryo's life in the balance Iwao reveals the location of the mirror to save his son. With the mirror recovered by Lan Di , Lan Di tells Iwao of a man by the name of Zhao Sunming ,a man allegedly killed by Iwao Hazuki. The two engage in battle once again ,Lan Di lands a deftly blow to Iwao leaving him for dead. With his final moments in Ryo' arms Iwao dies leaving young Ryo in despair and hot for revenge. By now I was hooked ,like some Kung Fu movie I had been taken in and had to know the truth ,but this time it was really up to me ,for I had become Ryo Hazuki and I wanted revenge …..
Ryo Hazuki - Time for some arcade action! 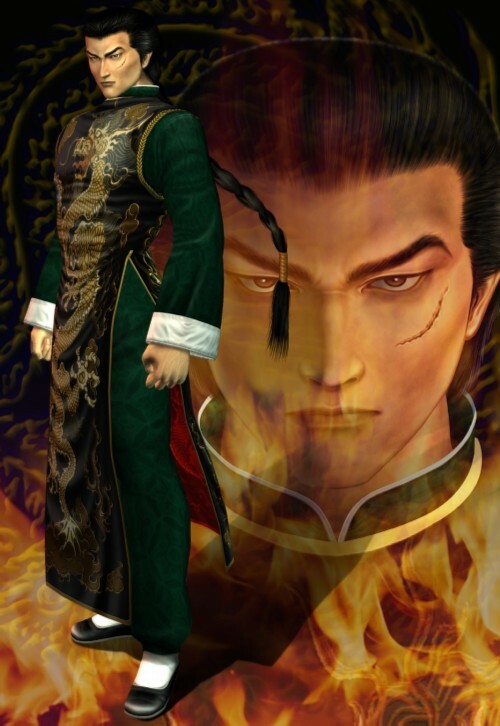 Now Ryo needs to find out why his father was killed for a mirror and who is Lan Di. His only clue is that the neighbours saw a black car speeding away on the day of the incident. 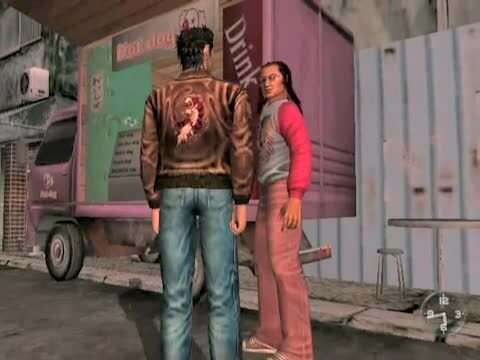 It's here my investigation will begin (told you I was Ryo Hazuki) , by talking to the towns folk and venturing into the shopping area of town Ryo will meet various characters who may or may not help him. Some characters just want to chat and others give vital clues to help you along. Ryo must do his investigation by day and get home by 11pm to sleep ( if you fail to get back home your automatically taken there to continue your quest the next day) . 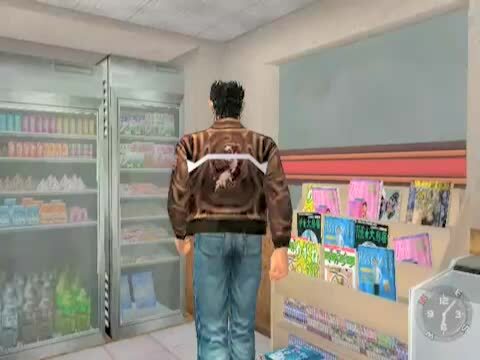 Ryo can also get food and drink from stores and Vending machines ,though these are not vital to survive in the game. But it's a fun way to pass the time. There's also a local games arcade where you can play Space Harrier and Hang On ( yes Yu Suzuki arcade games – awesome) , your find yourself frequenting the arcade for long periods sometimes that's all you want to do. There are other elements to ,your meet a old master who will teach you new fighting techniques ,there's also a place where you can train in town ,this is vital for you to practice your moves for R.E.A.L. 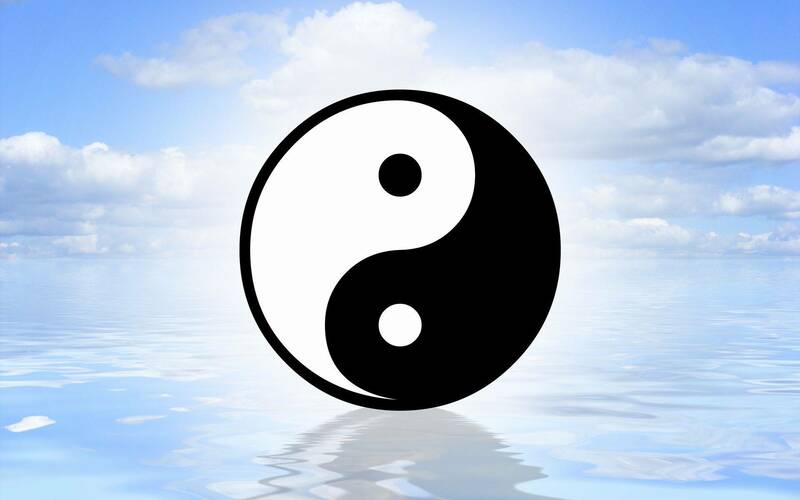 Time fighting ,fail to practice and when your up against adversaries your stamina will suffer . 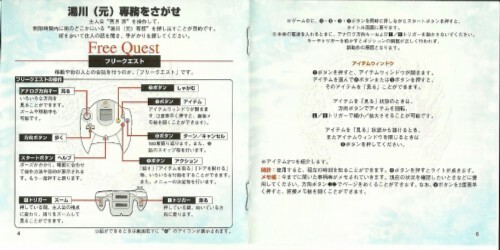 There's also the Quick Time Event or QTE ,these come along at certain points in the game ,they require to hit a button sequence which flashes up on screen in a certain time frame. Succeed and you get to move on ,fail and your left to try again until you do succeed. 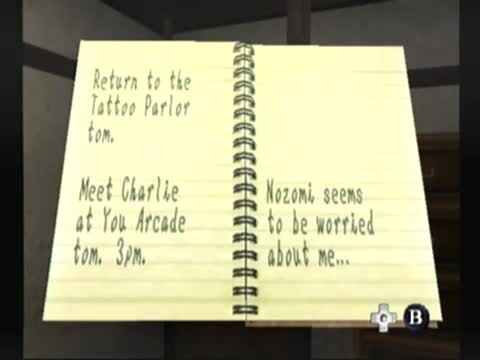 In fact the QTE events where a ingenious way to accomplish certain events ,such a good idea that many games publishers copied the style of game-play for their titles up until this very day. The clues don't come so fast in town and it's only when Ryo receives a letter from a man called Yuanda Zhu,in the letter it suggest Ryo seek the help of one Master Chen . Master Chen can be found at the harbour ,it's here that the story will start to unfold ,as Ryo will have to get a job at the harbour so he can investigate further ,also it's the place where he will come into contact with the Mad Angels who are a local gang connected to Lan Di. He will also find out about another mirror ,the Phoenix Mirror which also resides at his home. 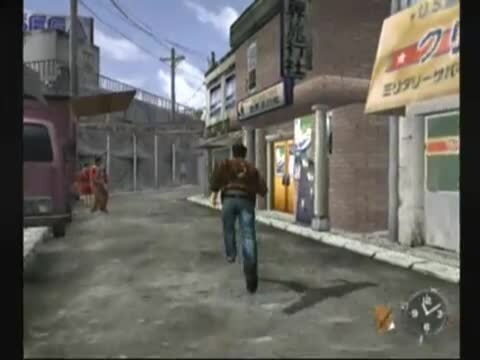 Again the wharf Harbour area has many other elements where you can be sidetracked ,such as playing darts in the workers café,and of course doing your job of driving a forklift truck,which is vital to progressing in the game, if you don't get the job by a certain time then your be left in Shenmue limbo unless you have previously saved game from a earlier area so you can try again. 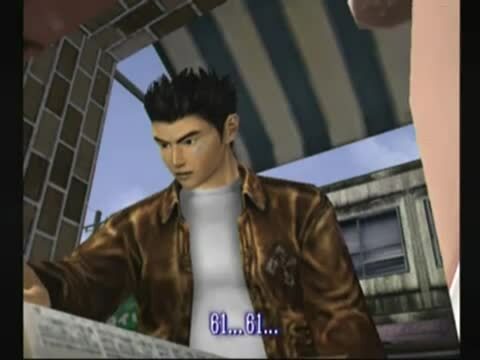 But if you manage to do the right things at the right time ,Shenmue will reward you with a sense of fantastic achievement . Nothing is more exciting then having to fight a 70 man battle and providing you have trained well your have little to no trouble getting through. But if you have failed to train your senses or techniques then chances are your be fighting the battle time and time again. 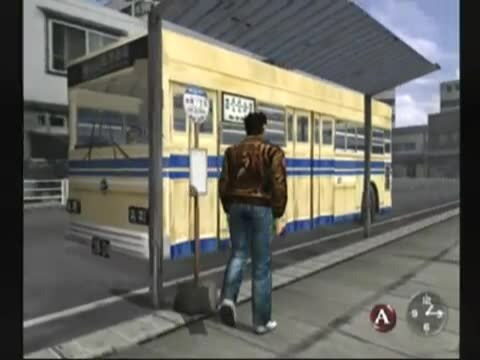 Of course Ryo will return in Shenmue 2 when he docks in Hong Kong but that's another story and another game. 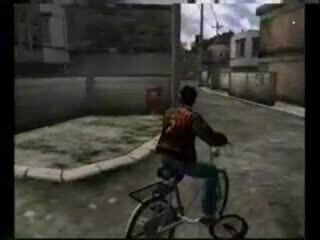 Originally ,there was a idea to have Ryo get around on a Bicycle , but the feature never made it into the final game, but it was implemented at some point ,as these pictures below show. 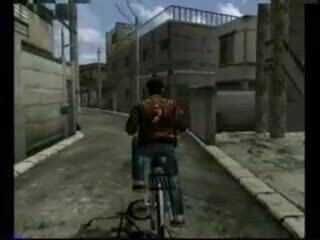 Now as I mentioned earlier Shenmue will take over your life , I use to frequent the local games shop close to where I worked everyday,the guys in there I new for many years and Shenmue was big news, I would go in every morning as I picked up breakfast ,everyone would be talking Shenmue ,each one telling each other where in the game they had got or how many hours they spent in the arcade playing Space Harrier ,Hang On or darts. Everyone would be bleary eyed as they had often got home after work entered their new found world and basically lost all sense of time ,finally realising at three O'clock in the morning that they had not eaten ,washed or relieved themselves . ..
No wonder I felt so tired ,i was living two lives. I remember listening to my brother telling me how my nephew was going on about getting a job at the harbour, it took him a while to realise he was talking about a video-game. Who's fault was it ? 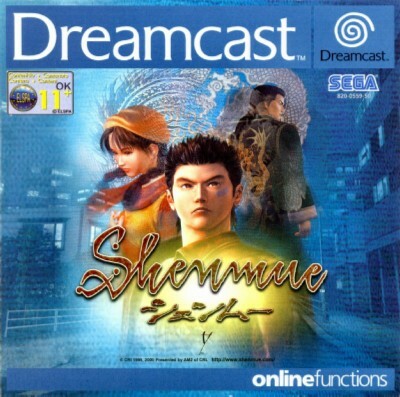 ,well mine of course I had persuaded everyone to have a Dreamcast and then said you have to have Shenmue! 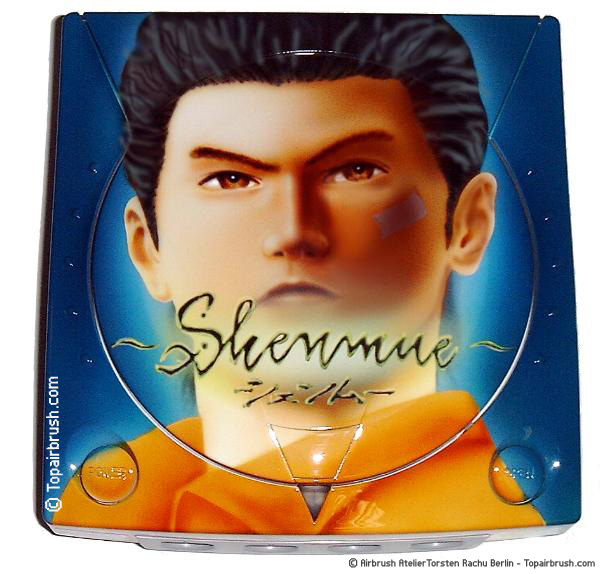 A airbrushed Dreamcast with a Ryo - now that's what i call dedication. 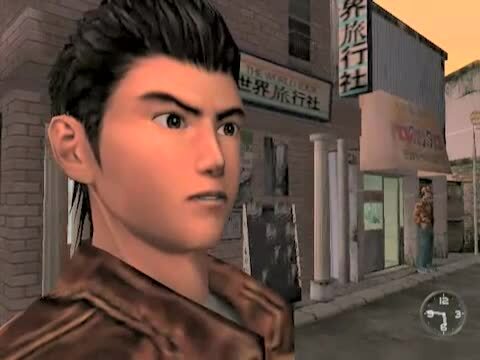 In terms of buying the game Shenmue was average ,think I paid around £36.00 for my package after my in-store discount (hell some people buy newspapers everyday ,i use to buy video games). 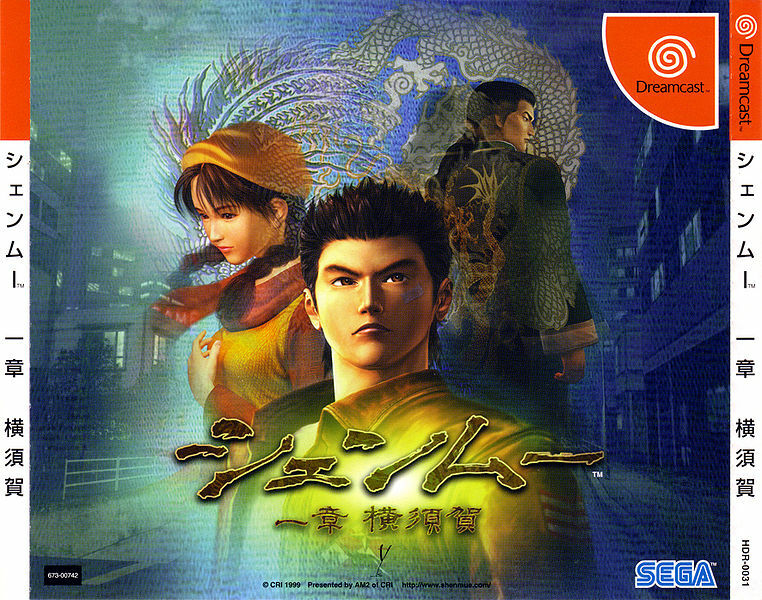 In terms of the game it self to produce it is said that it cost in the region of $70'000'000 ,it was also said that every Dreamcast owner would have to buy the game twice for SEGA to break even . Truth be told the game cost around $47'000'000 to make in 1999. Combined with part 2 it amounted to the $70 million ,still a lot of money and at that time SEGA was running at a loss with Dreamcast Consoles stock piled as not enough people took the challenge ,many waiting to see Sony's new PS2 which included a DVD player ( a big selling point at the time) Even by only subtitling part 2 and selling it for a very reasonable £29.99 ,they could not entice more consumers to go the Dreamcast route. 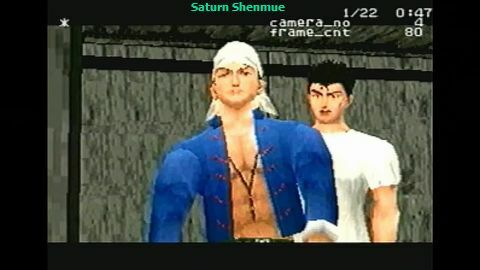 As with many Dreamcast games (that where not simple ports) the graphics where stunning ,nothing on any other gaming console looked so wonderful ,with HI-Rez graphics and in Shenmue a brilliant weather system where it could be bright sunshine one minute and as the day went on you could experience Rain or Snow ,there was even a detailed variation of representing the weather which was evident in the real Yokosuka in Japan between 1986 and 1987 ,which was the games time frame. 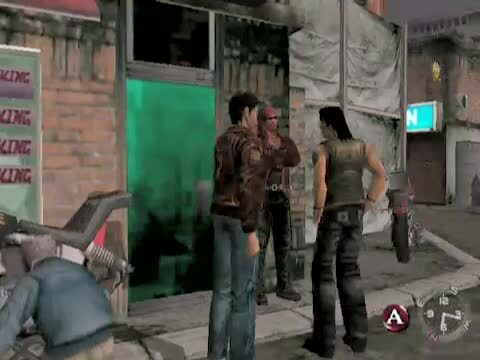 This gives Shenmue a distinct look ,one which changes each time you play. 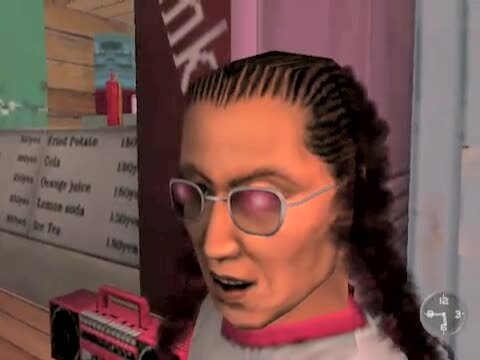 No wonder I mixed up my virtual life with my real one . 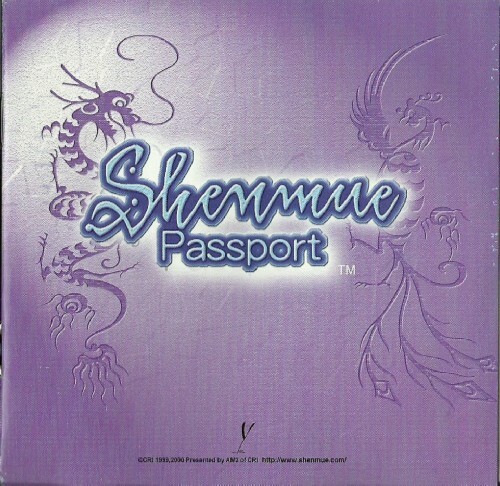 Shenmue also had a vast musical accompaniment which consisted of 32 tracks ,amounting to over two hours of music, The official soundtrack was released on the March 23rd 2000 by Toshiba EMI. It was mainly composed by SEGA'S Japanese video game composer ,Takenobu Mitsuyoshi. A further fifteen tracks where composed by Yuzo Koshiro. 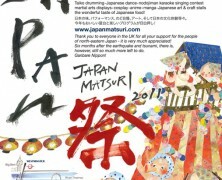 Consisting of mainly instrumental tracks there is however one vocal track which is sung in both English and Japanese. The soundtrack which was released only in Japan can fetch good money when it becomes available on sites like eBay and such like. 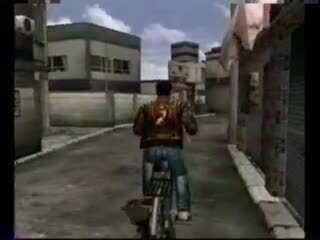 Released in Japan prior to the Japanese release ,as Shenmue was delayed in Japan, anyone per-ordering the game received ''What's Shenmue '' on the original day of release ,it was playable version of the game covering Dobuita ,you wondered around town and your quest was to find the offices of Sega executive Yukawa San. Not all sections of Dobuita where accessible and some characters blocked paths to other areas. There was also a giveaway of the preview on Japans gaming magazine ''Famitsu'' , this version featured a orange cover as opposed to the blue one. 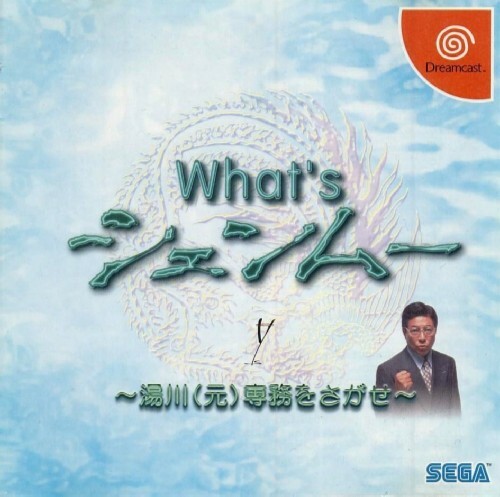 Of course now ''What's Shenmue ?'' can sell for more then copies of the original game at times. due to it's rarity. 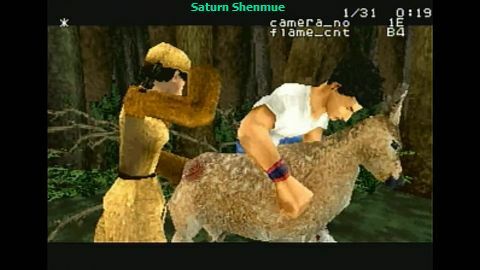 Shenmue the Movie was bundled with the Xbox release of Shenmue 2 , Where as in Europe we where lucky enough to get Shenmue 2 on Dreamcast as well as the Japanese ,in North America because of the decline of SEGA and Microsoft launching their new Console the XBOX ,it seemed fit to port Shenmue 2 to XBOX and launch it with a movie consisting of cut scenes from the first game to give newcomers the whole story. 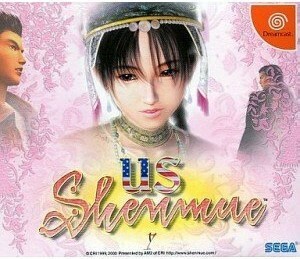 For this to happen SEGA had to agree to not release Shenmue 2 on Dreamcast in the USA. 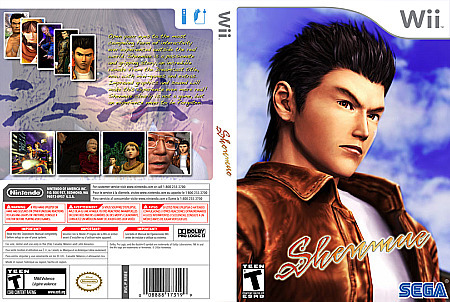 There fore forcing any Shenmue fans in the USA to fork out for a new Console to play part two or try and import a European copy of the game , and with not a vast number made for distribution in Europe this looked impossible. 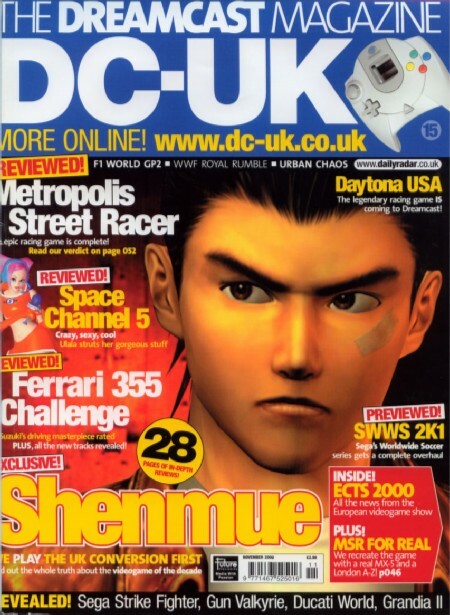 Of course here in the UK i was unwrapping my new copy of Shenmue II on Dreamcast. Funny thing as i also purchased the XBOX version as well when it was released. I think just so i could see the movie. 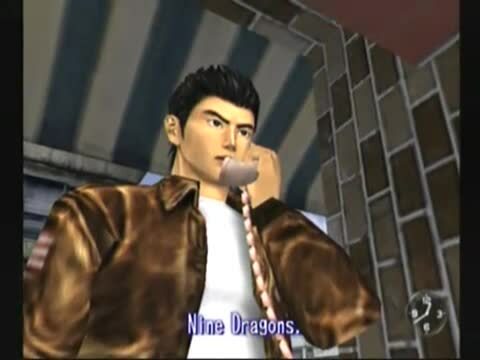 After hearing about Shenmue my anticipation for the game was so high , but on release day my retailer i used had a call to say their deliveries wont be until the following morning, i had to wait a whole twenty four hours before i could lay my hands on the game , and then i had to work the whole day until i got home to actually play it. 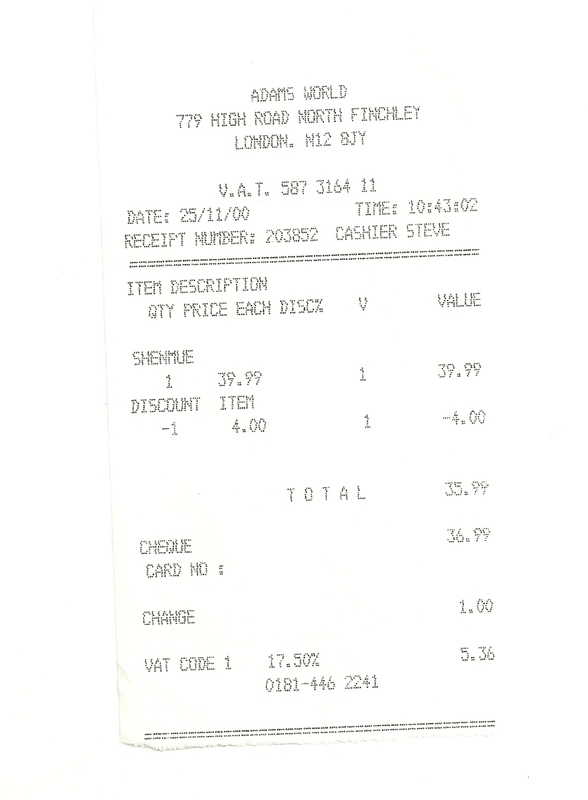 Here is my receipt for the greatest game ever. 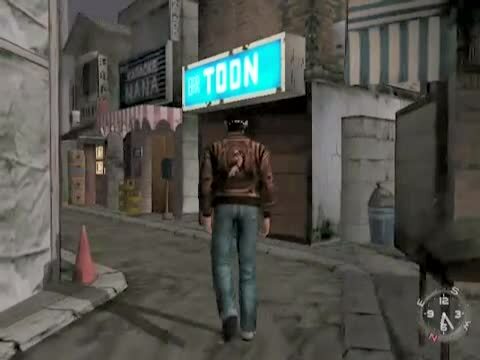 The shop closed down many Years ago ,but i remember the staff where so into Shenmue. 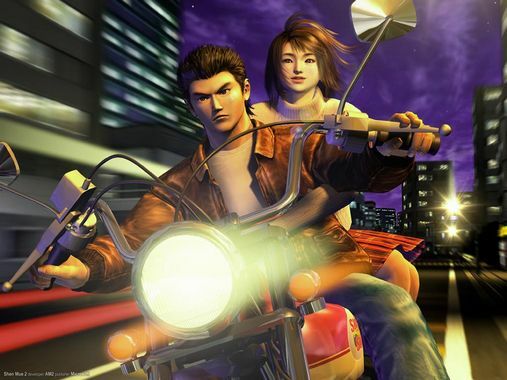 Announced 2012 ,SEGA has confirmed the development and finalisation of Shenmue HD on XBOX Live and PSN , as of yet the game has yet to see the light of day ,as soon as news arrives we will post it here . This is quite big news mainly because it will give the game a big audience to experience Yu Suzuki's masterpiece . 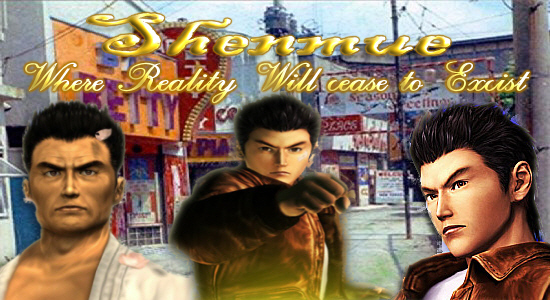 If successful it could mean that the possibility of Shenmue 3 is more then a dream to the waiting fans. Games writer for K.I.T.G. group of fan sites.